Henry Hill Hickman was a young Shropshire-born country doctor. He conceived, practised and promoted pain-free surgery, though its after-effects on the partially asphyxiated animals he mutilated were less benign. Hickman advocated what he called "suspended animation" [general aneasthesia] for surgery on humans as well. He had the right idea about inhalation anaesthesia but picked the wrong agent. Carbon dioxide can indeed induce unconsciousness, but the gas often induces panic attacks. Worse, in larger quantities it can easily kill. 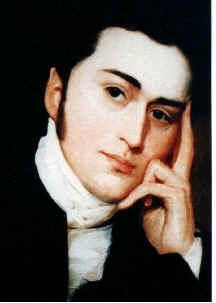 In 1826, Hickman's work was savaged in an article in The Lancet entitled "Surgical Humbug". Wounded but unbowed, Hickman decided to try his luck abroad. In 1828 he went to Paris and presented a paper to Bourbon King Charles X. The paper was forwarded to the Academie Royale de Medicine. A committee was set up to investigate Hickman's proposal for painless surgical operations on humans. It fizzled out inconclusively. Hickman had one real supporter, the famous surgeon Baron Dominique-Jean Larrey; but Hickman died young, a disappointed man.